TOMORROW (Thurs 1/31) I will be LIVE ON FACEBOOK at 11am PST / 2pm EST / 7pm GMT for the very first time! Click HERE to watch live or view the saved video later. Episode 1 Topic: The #1 thing that will up-level your understanding of breath support for singing. This is the MOST fundamental and FIRST thing I teach all of the singers who come to work with me privately, regardless if they’re an advanced singer or relatively new to technique. In my opinion, it’s the foundation that all other good singing technique is built on and I’ve got a whole new perspective on it for you LIVE TOMORROW. If you’ve been coasting along with the same understanding of support for a while, wondering if there’s another layer of ease and consistency in your singing, I hope you will watch. Now, enough business. Getting back to my subject for today. . . . . .
My favorite mindfulness teacher posted something on his Instagram a few days ago that I really want to share with you. First it made me laugh. Cause how many of us do that?? Why do we keep doing the same thing over an over again even though we KNOW it doesn’t work? Why do we keep “watering that dead plant”? You may have heard that the definition of insanity is doing the same thing over and over again and expecting a different outcome. 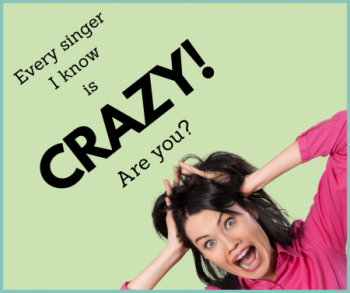 Well by that definition, most of the singers I know (and let’s face it, humans in general) are definitely insane . . . . . myself included! In my early singing training, I would get so frustrated with my lack of resonance and consistency in my middle voice (a typically difficult place for a high soprano when we’re young). Yet each time I approached specific notes or phrases in that part of my voice I would do the same thing – grab in the neck/jaw area, let my soft palate flop, and bear down with my tongue all the while abandoning the consistency of my support. While I couldn’t identify those specifics at the time, I did know that I didn’t like how it felt or how it sounded to sing in that part of my voice. It gave me anxiety. What’s worse, despite this frustration, I continued to approach it the same way. Every. Single. Time. What I really wanted was a more rounded, richer sound in my middle voice. So I contrived all these manipulations to get that sound and in doing so, I created a lot of tension and inconsistency. And I did it that way for a looooong time because of the reasons above: Fear (of not sounding good enough if I didn’t manipulate my sound), Habit (it’s what I’d always done and I really had no idea how to sing in that part of my voice in any other way), Denial (convincing myself there wasn’t ANY OTHER POSSIBLE WAY I could sound good). THIS was my metaphoric “dead plant”. All the manipulations in the world were not going to strengthen my middle voice – just like all the water in the world was not gonna bring that dead plant back to life. It took a very special voice teacher I found in my early 20’s to help me see that. Only when I was willing to stop “watering the dead plant” was I able to install a technique that strengthened my middle voice in an organic, efficient way, without all the manipulations. So . . . . .What “dead plant” in your singing do you continue to water without any results?? What aspect of your technique do you continue to approach the same way time and again without any real change? Are you ready to do it differently? 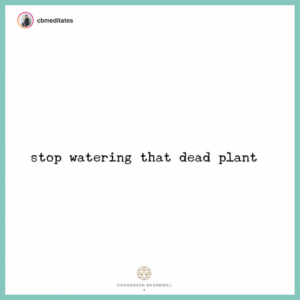 Are you ready to “stop watering that dead plant”? Take the first step towards change – be willing. With awareness and courage, you CAN make the changes that will allow you to sing with more power, freedom and consistency then you thought possible. But before anything else, it takes a commitment to yourself that you are no longer going to keep doing what’s not working. Instead, you are going to do the things that will foster the change you want – you might try a different voice teacher, come back to lessons if it’s been a while, experiment with different repertoire, do that online singing course you’ve had your eye on . . . . .
Whatever it is, you will find your way so long as you stop watering that dead plant!